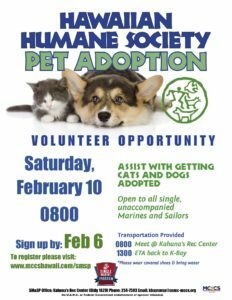 Assist with getting dogs and cats adopted. Open to all single, unaccompanied Marines & Sailors. Meet at Kahuna’s Rec Center. Please visit the SM&SP page if you would like to sign-up for this event.